Review of Two of Alexandra Fuller’s memoirs. I have heard some controversial opinions about Alexandra Fuller. Certain people from Zambia seem to dislike her a lot, for reasons I don’t understand. However, I am only interested in her writing and her books, which I have to say I thoroughly enjoyed. She lived a totally different life to the one I experienced growing up in Chingola, but that doesn’t make it any less real or authentic. In my opinion, it takes a huge amount of courage to write as honestly as she does, and her prose is electric with stories of what happened both to her and her family in Rhodesia, as it was then. ‘Cocktail Hour Under the Tree of Forgetfulness’ focuses on the life of Nicola Fuller of Central Africa, as she supposedly refers to herself. 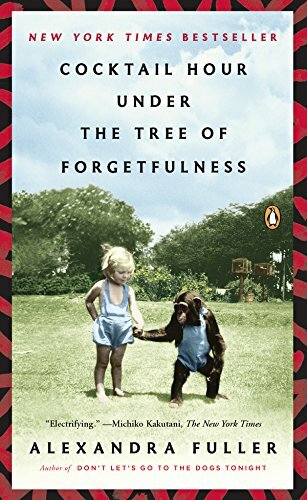 Fuller gives a detailed account of her mother’s upbringing both in Scotland and Kenya, before she moved to Rhodesia and lived through the war there. She writes without sentimentality, as she describes the highs and the lows of her mother’s incredible life. She also tells of Nicola Fuller’s depressions and highs before she is diagnosed as being Bi-Polar, and how this affects both Alexandra and her sister Vanessa. Nicola Fuller’s mental health begins to deteriorate after the death of her first child. More tragedy follows and with each tragedy she disappears increasingly into her own depressed inner world, and withdraws further away from her children. If ‘Don’t Let’s Go to the Dogs Tonight’ was a scathing reflection of her parents, then ‘Cocktail Hour Under the Tree of Forgetfulness’ is a tribute to a brave but slightly unhinged couple, who were captivated by the harsh realities of Africa, but found their love of the continent surpassed everything else. Make of that what you will. Sadly they are both living under delusions about the other and no-one can be all that. However initially they cling together in their individual hope and beliefs of the other and they try hard to make it work. After the birth of their three children, Fuller suffers from a severe bout of malaria and eventually for their own sanity, they move to Wyoming, USA. Fuller writes so honestly about the breakdown of her marriage, her own sanity and her own shortcomings that you cannot help but admire her. Well, I couldn’t anyway. Whatever you may feel about her on a personal level, she writes beautifully about both the beauty of Africa and the trials and challenges of the human condition. I thoroughly enjoyed both of these books and I would recommend them without hesitation.